This new policy brief, which synthesizes research from the Haas Institute Diversity and Democracy affiliated faculty, lifts up lessons from recent research on how to confront voter disaffection, support inclusive identities, and increase democratic participation among underrepresented groups. The brief argues that many conventions of polling, categorizing, and engaging voters in campaign outreach reinforce chronic disparities in US election turnout—disparities that are particularly stark in midterm years like 2018. If we are to work toward a voting electorate that more closely mirrors the country’s diverse citizenry, we must confront the ways the information we do or don’t collect—and the outreach we do or don’t fund—contributes to a cycle of exclusion and non-participation. 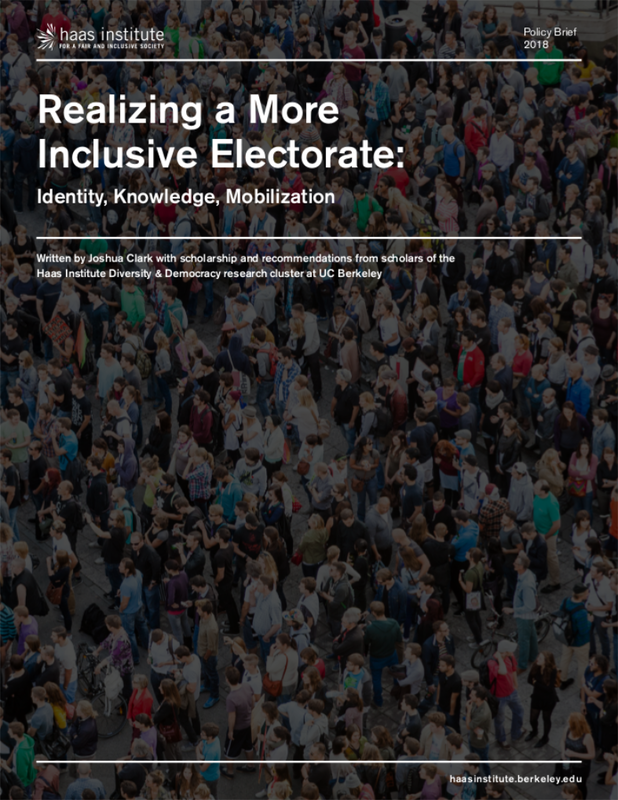 Titled “Realizing a More Inclusive Electorate: Identity, Knowledge, Mobilization,” this brief draws together salient findings from scholarship by the Diversity and Democracy cluster at UC Berkeley. It makes a series of evidence-based recommendations on how researchers, pollsters, political donors, and public officials can make their work supportive of broader and more inclusive civic participation. In particular, the brief encourages donors and philanthropists to invest in democracy itself by supporting organizations that carry out year-round civic engagement, leadership development, and capacity building in communities and demographic groups that partisan campaigns often pass over—most notably young people age 18-29, and many communities of color. It also summarizes important new research on public distrust of media, and its relationship to declining support for democracy and increasing hostility toward religious, national, and racial "others."